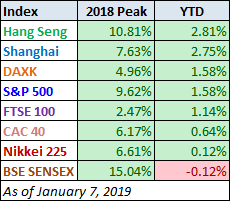 All but one of eight indexes on our world watch list posted gains in the first week of 2019. The top performer is Hong Kong's Hang Seng with a 2.81% gain and in second is Shanghai's SSE with a gain of 2.75%. In third is Germany's DAXK with a gain of 1.58%. Coming in last is India's BSE SENSEX with a minor loss of 0.12%. 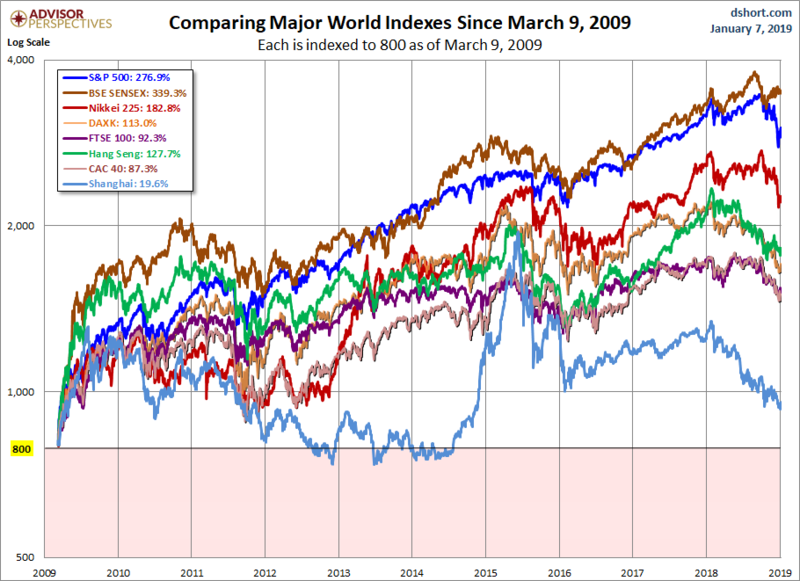 Here are all eight world indexes sorted by YTD. 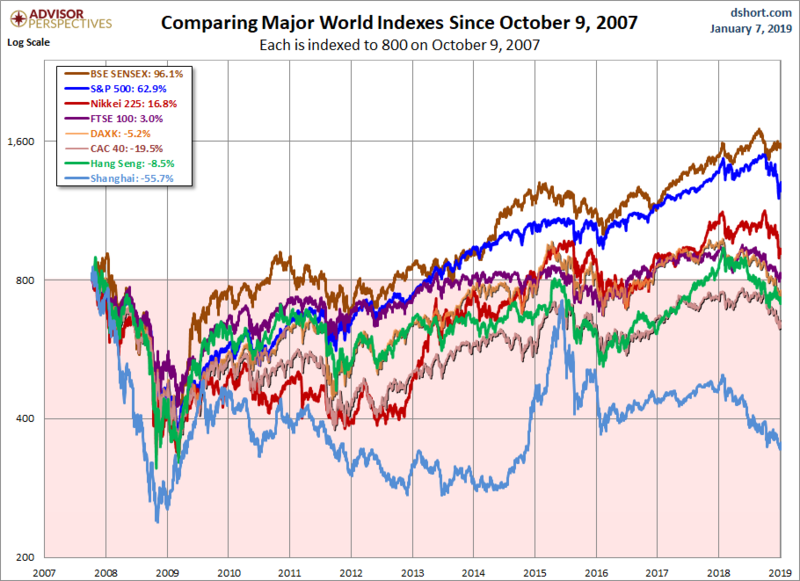 The chart below illustrates the comparative performance of World Markets since March 9, 2009. The start date is arbitrary: The S&P 500, CAC 40 and BSE SENSEX hit their lows on March 9th, the Nikkei 225 on March 10th, the DAXK on March 6th, the FTSE on March 3rd, the Shanghai Composite on November 4, 2008, and the Hang Seng even earlier on October 27, 2008. However, by aligning on the same day and using a log scale vertical axis, we get an excellent visualization of the relative performance. We've indexed each of the eight to 800 on the March 9th start date. The callout in the upper left corner shows the percent change from the start date to the latest weekly close. Here is the same visualization, this time starting on October 9, 2007, the closing high for the S&P 500, a date that is approximately the mid-point of the range of market peaks, which started on June 1st for the CAC 40 and ended on January 8, 2008 for the SENSEX. 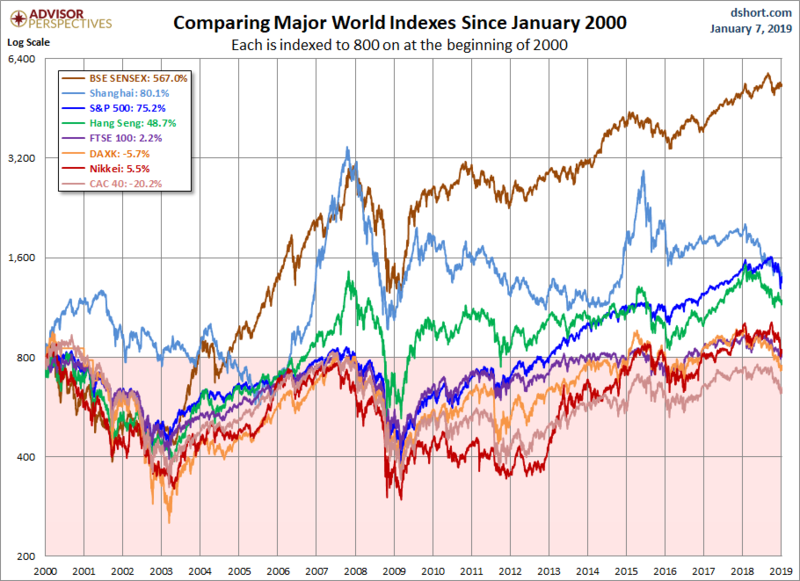 For a longer look at the relative performance, our final chart starts at the turn of the century, again indexing each at 800 for the start date. Check back next week for a new update. Note: We track Germany's DAXK a price-only index, instead of the more familiar DAX index (which includes dividends), for consistency with the other indexes, which do not include dividends. All the indexes are calculated in their local currencies.